One would never suspect that Florida-based blues guitarist David Julia is still just a teenager and will be for another couple of years. The kid is well advanced beyond his years, musically-speaking. Veteran bluesman Bob Margolin has said about Julia that he has a combination of "old soul and youthful fire." After previously releasing a short EP, Julia's first full-length album, Inspired (VizzTone), is out and it's a winner. 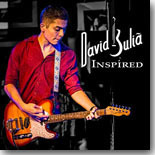 Produced by Mike Zito, Inspired is a mix of well-chosen covers and Julia originals. He's backed by a tight band of Elliot Keys (B3), Lonnie Trevino Jr. (bass), Matthew R. Johnson (drums) and Lewis Stephens (piano). Julia shows his stuff right from the start, with some hot guitar licks on the up-tempo original "Hey There Sally" and then as he packs plenty of emotion into his guitar on the slow blues "Throw Me A Rope," another original composition. Julia rocks out on the mid-tempo "Something Ain't Right," written by fellow Floridian JP Soars. The instrumental "Sunshine Boogie" gives Julia a chance to really stretch out on guitar with some rapid-fire picking similar to what we used to hear from guitar geniuses like Danny Gatton and Roy Buchanan. He follows with a slow ballad, "If Only," with Keys taking it to church on the B3, before slowing down the tempo on a Tab Benoit number, "Nice and Warm." Another creative original is the funky, edgy "Don't Get Me Goin'," on which Julia does a bit of a rap with his vocals. At this point in the album I was ready to characterize Julia's vocals as good but with the potential to get stronger with maturity. But his voice gets that added strength further into the disc, especially on the slow blues "Empty Promises," done originally by Michael Burks and then on the mid-tempo blues shuffle, "Keep Her Around Too Long" which has nice piano accompaniment from Stephens. Perhaps Julia's best vocal performance comes on the stop-time, mid-tempo blues shuffle "Clean Break." One of my favorite performances on the disc comes with the closing number, "You Don't Need No Shelter," showcasing Julia's versatility as he performs in an acoustic setting in a duo setting with producer Zito. Nice. Inspired will certainly make my Top Ten list for 2018 and it shows that Julia is a performer to be followed closely as his career develops. I can't wait for the follow-up to see what's next for the young man.